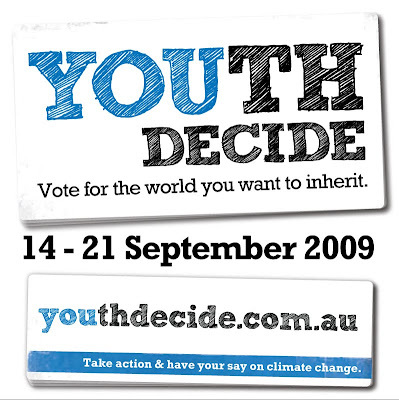 Tim has started volunteering for YOUth Decide, which is run by World Vision and the Australian Youth Climate Coalition. They're hosting an voting week in September that gives young Australians (from 12-29) the power to make significant positive change to help our futures. You vote by choosing one of three options online during 14-21 September (register to vote and get a reminder!). The results of our voting will be taken to the crucial United Nations climate change negotiations in Copenhagen this December. They need at least tens of thousands of us to vote for it to have an effect. They're campaigning like crazy, have enlisted celebrities, gotten some major sponsors and they're encouraging people all over Australia to host voting events. Just voting isn't enough. Tell your friends, blog about it, add it to your website, tweet it, and post it in your Facebook updates! Attend an event in your area, or organise one yourself! The more people that vote and the more attention this gets, the bigger difference it will make. 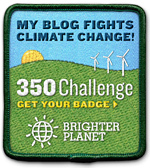 To repost, you can use the banner at the top of my blog, or the image in this post, or use their other promo material. Thanks for sharing this Halyey.